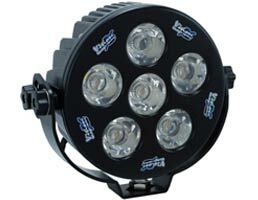 This Auxiliary light is Equipped with a brand new 10 watt LED technology, with each 10 watt LED producing 800 lumens producing 4800 Lumens (500 watt halogen equivalent) making them the brightest LED off road lamp on the market in such a compact design. Not only are they the brightest, they are the most efficient drawing less than 3 amps due to their advanced electronic drivers which are also responsible for their 50,000 hour life span and variable 9-60 Volt DC input. Other key features include; Rugged die-cast aluminum housing provides optimum durability and heat dissipation. The Solstice series also feature an IP68 ingress protection rated housing making them impenetrable to dust and submersible under water up to 3 meters. The unbreakable polycarbonate lenses are housed by a 6061 aluminum face plate which doubles as a radiant heat sink to melt away snow and ice in frigid conditions. The stainless steel mounting bracket features knurled aiming knobs for 90 degrees of adjustment and is centered on the profile of the lights which provides a slim 1.5� mounting depth. This LED Light has also been subjected to a 6Grms vibration test to ensure the performance in high impact conditions. Built to last, these lights also feature a lifetime warranty. Dimensions: 3.5" x 7" x 6.75"